Planning an Ocean Theme? Look no further — we’ve got you covered! 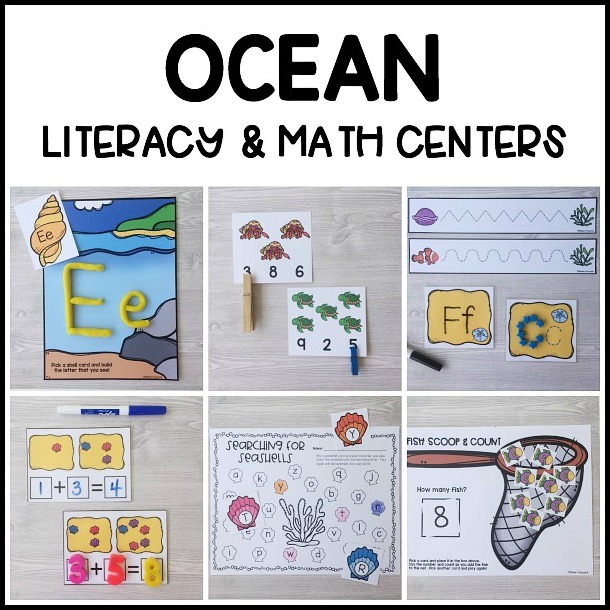 These Ocean Literacy & Math Centers are perfect for preschoolers and kindergarteners AND for teachers who are into super simple, low prep learning activities. BUT WAIT! Before you click add to cart, I want to introduce you to a deal you won’t want to miss. 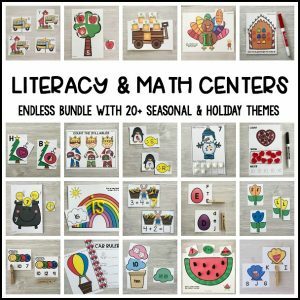 Our ENDLESS Themed Literacy & Math Bundle is calling your name. You read that right. ENDLESS. Best deal ever. Now if Ocean is your #1 theme or you want to try a set before committing to the ENDLESS bundle, go ahead. 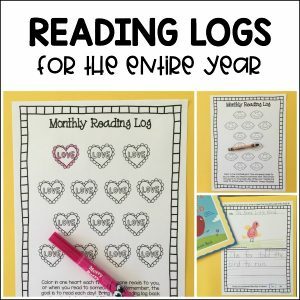 Grab the 15 printable activities now! 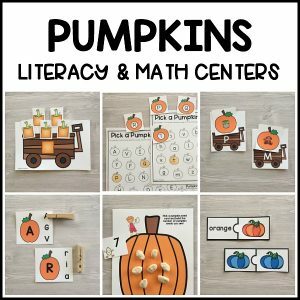 What’s included in the Ocean Literacy & Math Centers? Check out the photos above and the activity descriptions below. Searching for Seashells – Pick an uppercase seashell car and find the matching letter on the recording sheet. Color the matching shell and play again! 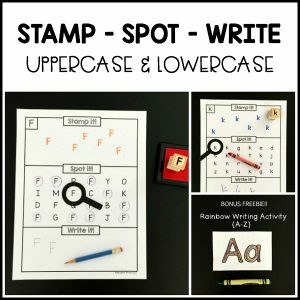 (2 versions – uppercase & lowercase recording sheets) Add the seashell cards to a small bin with sand and you’ve got a literacy-based sensory bin. Ocean Alphabet Play Dough Mats – Laminate (or use page protector) the play dough mat. Pick a letter card and build the uppercase and/or lowercase letter out of play dough. Pre-writing Ocean Cards – Laminate the cards and use dry erase markers to trace the lines from ocean animal to seaweed. 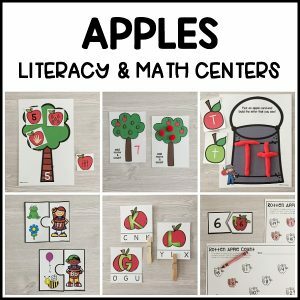 Alphabet Tracing Beach Cards – Laminate and trace uppercase and lowercase letters with dry erase markers or build letters with manipulatives (star beads, buttons, etc). Write Around the Sea – Cut apart ocean animal cards (uppercase & lowercase versions included) and play around the room. 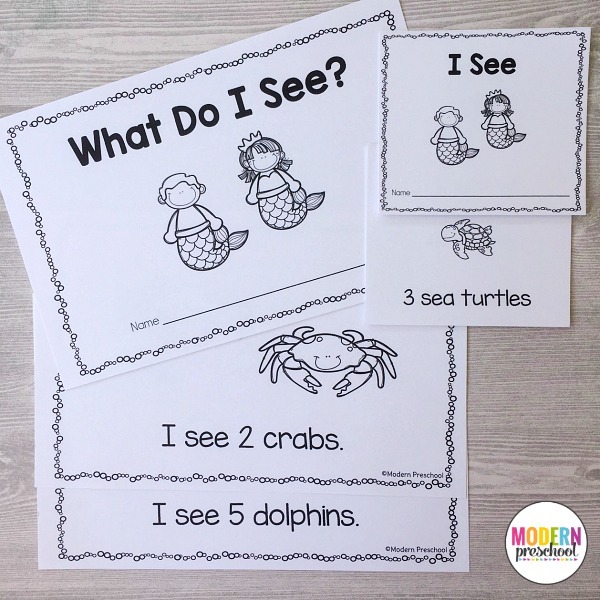 Use recording sheet (3 versions – blank, uppercase trace, lowercase trace) to label the ocean animals! Fish Alphabet Match – Match the uppercase and/or lowercase fish cards to the matching coral card. Differentiate according to learning levels. —-> “What Do I See?” – 2 pages of reader on each page to make prepping the books easy. Print, cut apart, and staple together. —-> “I See” – Print and cut apart. All pages of book included on one page. Beginning Sound Ocean Clip Cards – Cut clothespin clip cards apart and add to a basket or tray. Clip the initial sound of each picture. Ocean Animal 10 Frame Match – Match the correct number with the ten frame. Numbers 0-10 are included. Fishing for Missing Numbers – Cut apart fish cards. Each card includes a number sequence with a missing number 1-20. Use the 1-10 reordering sheet for beginners and 11-20 recording sheet for more advanced learners. Ocean Animals Roll & Graph – Printable dice templates are included. Roll a die, record the roll on the graph. Roll again! 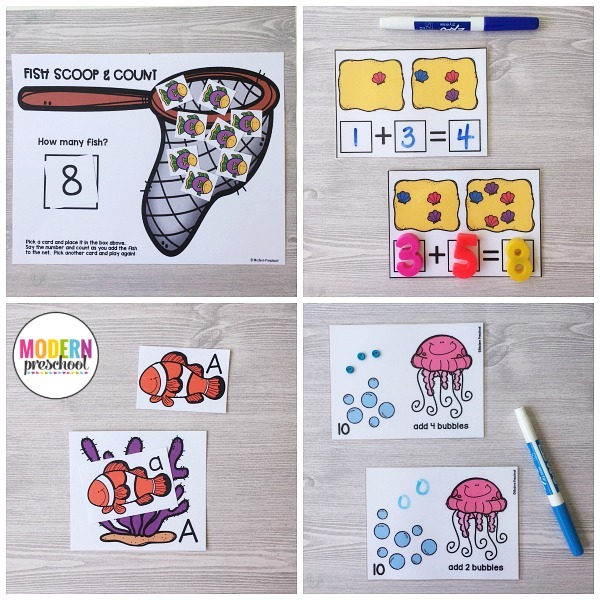 Fish Scoop & Count – Place the number card on the fish net math mat. Use the mini fish cards to count as each fish is added to the net. Count up to the number, clear the net, and play again! 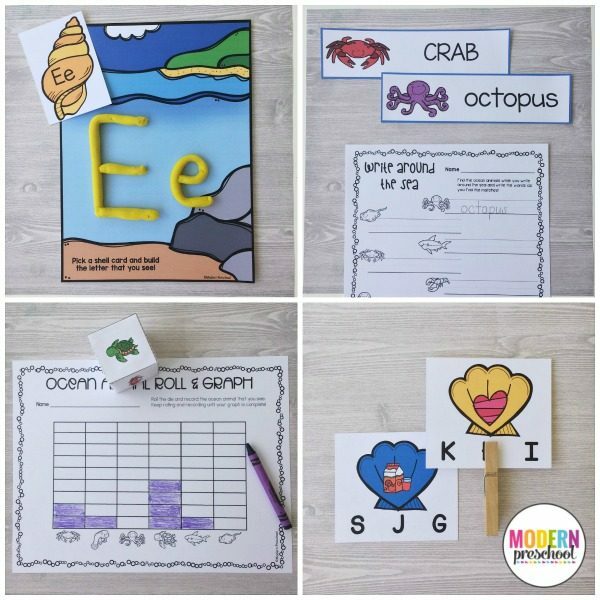 Seashell Addition Cards – Laminate and use dry erase markers to write the correct number of seashells in the addition equation. Add the numbers together and write the answer! Use number magnets and a cookie sheet for a fun twist. 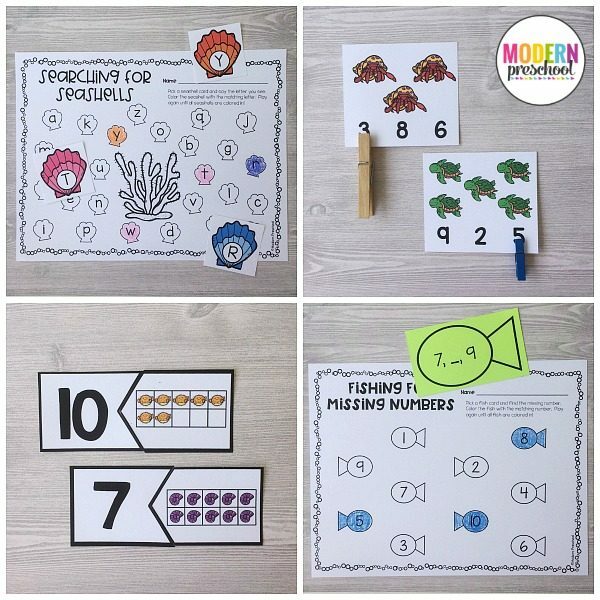 Making 10 Bubbles – Laminate and use dry erase markers (or fun manipulatives – pom poms, buttons, etc) to add the correct number of bubbles to the cards to make 10. Ocean Count & Clip Cards – Cut cards apart and use clothespins to clip the correct number of ocean animals 1-20. Pick a new card and play again! 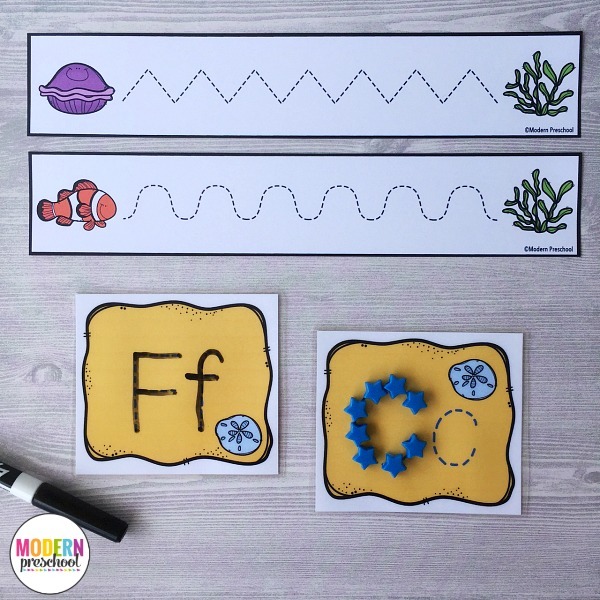 Continue your learning journey under the sea with our Ocean Fine Motor Busy Bins!